My theater is seemingly going out the window. 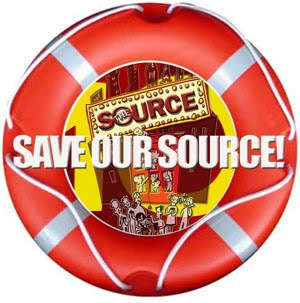 Now, over the course of the last 10 years the management of Manhattan Theatresource has gotten panicked on average of about every 4 to 6 months with "We're going to have to close the Source if we don't get x number of dollars!" Or "There's no way we can stay open, we're just going to have to close!" Bla bla bla. It was tiresome to say the least. Well, finally about two years ago we got an outside General Manager and Artistic Director. From our position -- meaning those in the back little office where we have our studio -- life got better because all of a sudden we weren't hearing about how Manhattan Theatre Source was about to close all the time. It was nice, like the adults were back in charge. Even better -- the debt on the balance sheet dropped from about $100K to about $48K over the following 18 months. And yet even better -- artistically the theater had arguably the best run its ever had. Hands down the best work we've ever produced happened during that period. As I recall, 5 Source writers had shows in the New York Fringe Festival, and 2 more plays were selected to be published in the Best Plays book. And -- whadaya know -- Manhattan Theatre Source is in constant financial crisis now. So the big question I keep getting asked recently is: "Is it worth it to give any money to Theatresource?" Frequently this comes up from people who gave money to the last "OMG we need money right now or we're going to close our doors!" freakout just a few months ago. Because if Theatresource is going to close anyway, then giving them money now is just putting good money after bad. And also, and not incidentally, giving money to these constant campaigns is rewarding bad management. Manhattan Theatre Source's revenue over the last six months is way down. We've had a shocking number of dark weekends. Dark weekends. I don't think we've ever had a dark weekend before (except possibly when Christmas fell on a weekend.) It's not because of "the economy" or any bigger-picture-issue, but simply because the present management has done such a lousy job of renting the space. They've allowed theater companies to string them along until the last minute -- while turning down other companies wanting to rent the space -- only to have the first company decide it wants to "renegotiate" the contract. The incompetence is at a sorta stunning level. So what's the alternative? Does the whole thing just go down the drain? Well, it's possible that yes it goes down the drain and yes, it's possible that's a good thing. The lease to the building we're in comes up on November 30th. And Theatresource owes the landlord a whole bunch of cash in back-taxes. Now what a smart theater-producing outside entity (probably a 501c, but not necessarily - after all MTS got its 501c status a year or so after we opened) might very well have already gone to the landlord and said "When Theatresource defaults, we'll pick up the lease." The advantage is to the landlord and the new tenant because if the renter defaults in this kind of commercial lease, the landlord gets to keep all the "stuff" inside. This happens to restaurants all the time. That's the biz. So the new entity gets one of New York Magazine's 5 Best Off-off Broadway theaters, loaded with lights, seats, cash register, and a pile o'computers, for the cost of the first month's rent and a security deposit. That's a pretty good deal. If that entity has no other debt, then it enters into that lease debt-free. That's fairly advantageous, for someone who wants to manage a theater. And there are lots of someones like that who are also good at managing and who come up with an operating budget for themselves every year -- while paying rent at other theaters. Now they wouldn't have to pay rent to outside theaters as they'd have their own. The less Machiavellian method would be for the outside entity to come to Theatresource and say "We'll take over, we'll come up with enough money to pay off the debt, and you'll get out of our way because we're replacing the Board with friendlies." Either method would work. They'd fire the General Manager, (hopefully) hire a Technical Director and make sure the PR machine actually worked. In any case, the question arises as to what will Pandora Machine do if Theatresource defaults? 4. Negotiate a deal with whatever new entity takes over Theatresource. So right now I don't know whether to get a van and a couple big guys and move ourselves out, or just sit and wait it out. We probably won't really know what happens until December 1. And of course it's possible that Theatresource will come up with enough cash and negotiate with the landlord enough that it will simply continue to limp along. Guessing the odds on something like this is virtually impossible. But I'll try it anyway. I'd say from my experience there's about a 40% chance that Theatresource will effectively renew the lease and continue to limp along, a 50% chance that another entity will take over -- either via "hostile" or "friendly" means, and a 10% chance that we'll all just move out and the building will stay fallow for some amount of time. Won't really know 'till December 1st, will we?